When babies are born they can look a little different to how their parents imagined, often taking a few days or weeks to settle into themselves. One condition which can affect their appearance is neonatal jaundice – here’s what you need to know about it. Jaundice is a health condition where the skin and/or eyes have a yellowish tinge caused by an excessive amount of the chemical bilirubin in the blood and tissues. It generally occurs when there is liver disease, an obstruction of the bile duct or a lot of red blood cells being broken down. 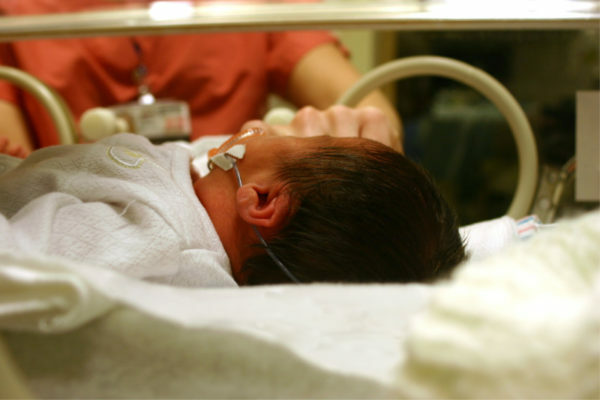 In newborn babies, it’s known as neonatal hyperbilirubinemia (jaundice) or physiological jaundice and happens because their livers aren’t yet developed enough to sufficiently remove the excess bilirubin. Yes, mild jaundice occurs in around 60 percent of all full-term newborn babies and up to 80 percent of premature babies; however, all babies will have elevated levels of bilirubin even if they don’t show signs of jaundice. A chemical in breast milk can also interfere with the breakdown of bilirubi initially until the baby is a few weeks old. Although it’s nothing to worry about, it is another contributing factor as to why so many babies get jaundice. Their skin has a yellow tinge, usually appearing on the face and scalp first and spreading to the body. The white parts of their eyes (sclera) have a yellow tinge. The palms of their hands and soles of the feet are turning yellow (in severe jaundice). Light-coloured poo and dark urine (in some cases). Fact check: Is it REALLY a bad idea to kiss newborn babies? In rare cases, jaundice is caused by other factors which can then lead to more severe symptoms and side-effects such as deafness and brain damage if left untreated. Biliary atresia is one of these conditions, where the baby looks well at first but then can get very sick with serious liver disease. In the instance, jaundice will last longer than two weeks and is caused by scarring in the tubes which carry bile from the liver to the intestine. Another rare type of jaundice is when the mother and her second baby’s blood groups are incompatible, causing the mother’s antibodies to attack the baby’s red blood cells leading to more bilirubin being released (it doesn’t happen with the first pregnancy, however, because it’s only during birth where a mother and her baby’s bloodstreams will mix). This type of jaundice appears in the first 24 hours after birth. They’re feeding poorly, unwell or not gaining weight. Jaundice appears quite early after birth. Poo is pale and wee dark. Jaundice becomes more noticeable after the first week. Jaundice hasn’t gone away after two weeks. The baby was very premature or are very sick. Mild jaundice or jaundice caused by breast milk feeding is pretty harmless and will usually disappear on its own after a couple of weeks. Sometimes bilirubin levels may be checked via a simple heel blood prick test, however, babies just need to be monitored and fed fluids regularly (breast milk or formula). If the jaundice is quite serious and bilirubin levels are high, then phototherapy treatment may be required for a few days. This is when the baby is given eye covers and placed naked in a special incubator under a blue phototherapy lamp to allow the ultraviolet light to help break down the overload of bilirubin. An alternative to this is the ‘biliblanket’ which has the same effect. Both processes are quite safe with minimal side-effects. However, babies may just get a minor rash, require extra feeds or have runnier poos than normal. In very severe cases of jaundice, babies may require a blood transfusion but this is very rare. Other more serious treatments for rare cases include diet changes, medication and surgery. If you are at all concerned about your baby’s jaundice, appearance or wellbeing, please speak to a health professional.